These easy chocolate oatmeal bars are made with a brown sugar and oat crust topping and a rich chocolate filling. The filling is super easy to make with sweetened condensed milk and chocolate chips. Chopped pecans or walnuts are added to the filling for the extra crunch. 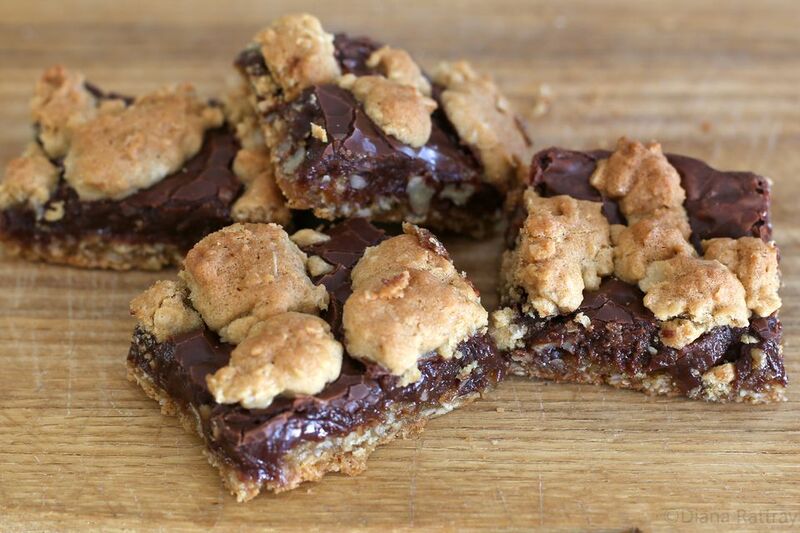 If you or your family aren't a fan of nuts, add some toasted coconut or toffee bits. In a large bowl, cream together 1 cup butter and brown sugar. Beat in eggs and 2 teaspoons vanilla. In another bowl combine the flour, baking soda, and 1 teaspoon salt; stir in oats. Stir dry ingredients into the creamed mixture until well blended; set aside. Pat about three-quarters of the oat mixture into the bottom of the prepared sheet pan. Set aside the remaining oat mixture. In a heavy saucepan over low heat combine the sweetened condensed milk, chocolate chips, 2 tablespoons butter, and 1/2 teaspoon salt. Stir until the chocolate chips have melted and the mixture is smooth. Stir in 2 teaspoons vanilla and pecans or walnuts. Spread the filling mixture over bottom crust in the baking pan, and then crumble the remaining oat mixture evenly over the top. Bake the bars in the preheated oven for 20 to 25 minutes. Cool before cutting into squares.